The village of Akitsu in Hiroshima Prefecture, where the Fukucho Sake Brewery is located, is a quiet place facing the Seto Inland Sea. From long ago it has been famous as a village from which many toji (master brewers) and kurabito (brewery workers) come, and sake brewers from here can be found at breweries in the village of Saijo in Hiroshima, known as the local “sake capital,” as well as all over the country. Akitsu was also the home of Sanzaburo Miura, a brewing expert that, in the late 1800s and early 1900s, taught many brewers how to brew with soft water and make high quality ginjo-shu. This is why people say that ginjo-shu was born in Hiroshima. Our name, Fukucho, was given to our sake by Mr. Miura. The village of Akitsu; with a proud history of famous sake and known as the home of famous toji. Espoused by this father of Hiroshima sake, Sanzaburo Miura, are the words “Try a hundred things, and make a thousand improvements.” Fukucho carries on this enthusiastic attitude as a tradition today. In order to make something delicious, you must start with good ingredients. And for making sake, it is a given that we must have especially good rice. We convey our thoughts about sake brewing to the producers, whereupon they grow for us long-stalk sake rice that is actually quite hard to grow. The yields are low, but the quality of this rice is quite high. Naturally, rice growers make a lot more profit growing rice with high yields, so it is very difficult to convince them to put quality first. We take time in the spring and fall to go around and visit the rice fields to check the condition of the rice. At Fukucho, we put a lot of effort into brewing sake using Hiroshima rice and older rice strains, but these types of rice grow tall, and the ears do not line up at the same height, so it is difficult to harvest. Little by little, we ask the farmers to put in more effort than usual, but our attitude is not one of simply obtaining good material, but rather one of coming together with the farmers, making rice, and then making sake with that rice. This is the intention and thinking behind our efforts. 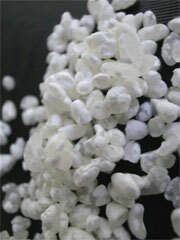 The rice used in sake brewing is milled to a high degree using a special machine over a long period of time. After several days of milling in a machine like this, the moisture content of the rice is drastically reduced from the heat of friction. If rice in this condition were to be suddenly put into water, it would absorb the water so quickly that it would crack. This is not good for brewing sake, so the rice is therefore allowed to sit about a month and naturally let the moisture content return to a higher level. Even so, the only part of highly milled rice that remains is the soft center part, so when it is soaked in water, it is done for a period of time that is controlled down to the second. At Fukucho, in order to control the moisture content of our rice, we treat the rice for all of our sake the same way we do for our daiginjo rice. This means we wash and soak it in small units of ten kilograms. Sake brewing at Fukucho, which puts great emphasis on the details, cannot allow for leaving things up to machines or doing things in large batches, and indeed begins with looking at the rice itself. In order to allow a thorough fermentation at the low temperature of about 10C for a very long period of up to 30 days, it is imperative that the rice be carefully steamed so as to be in an ideal condition. If it is too soft, it will break down as it dissolves, but if it is too hard it will not dissolve enough but rather remain in the tank and get filtered out later. Also, if it does not have a certain degree of firmness and elasticity, we cannot create proper koji for brewing ginjo-grade sake, and indeed proper koji making is the most important step of making sake. The ideal condition for steamed rice is “gaikou-nainan,” or hard on the outside and soft on the inside. This is the exact opposite of “al dente,” the ideal condition for making pasta. In order to achieve this, we must use something similar to a “wagama,” or a large Japanese pot for boiling the water. We put great care into the amount of steam, its temperature, and its moisture content, which in turn allows us to control the softness and dryness of the steamed rice, making it ideal for long, slow fermentation. Most alcoholic beverages including wine and beer are made by obtaining sugar from the raw materials. However, nihonshu is the only alcoholic beverage in the world in which starch is converted into sugar within the fermentation tank simultaneously with the fermentation of that sugar into alcohol. This high level brewing method is known as “multiple parallel fermentation.” The koji that creates the glucose is the nucleus of this technology. This is true to such a degree, that from long ago the fact that koji-making is the most important step of the process and determines the flavor of the sake more than any other thing else, has been immortalized in the expression, “first the koji, then the yeast starter, then the actual fermentation.” Not only must the koji be able to convert starch to sugar effectively and strongly, but for making proper ginjo it must be able to do this slowly and over a long period of time. In order to make koji like this, it is important to control not only temperature and humidity, but also the flavors, aromas, and texture as well through delicate efforts. At Fukucho, we make all of our koji by hand and with wooden implements as was done long ago. It is very difficult work, calling for attention both day and night, but we can allow no compromises when we brew sake at Fukucho. As a sake brewery located in the town of Akitsu in Hiroshima, the birthplace of ginjo-shu brewing, at Fukucho we brew all of our sake as if it were daiginjo, which means at low temperatures for long periods of time. The only thing that differs from tank to tank are the varieties of rice and the degree of milling. We feel it conveys our true intentions as a sake brewer to use the best techniques we can regardless of the raw materials. Fermentation takes place at about 6C, which is barely warm enough for the yeast to survive. It is necessary to control the temperature down to 0.1C over the long 30-day fermentation period, but if the size of the batch is too large, it is not possible to do this. This is why at Fukucho our largest batch is comprised of only 1300 kilograms of rice. Small batches like this make it possible to make quality a priority over quantity, and to control the temperature in pursuit of such quality. Sake brewing most often focuses on fermenting rice to make sake, but it is entirely possible to ruin a good sake by improper bottling technique. Just after pressing sake is a bit rough, and after a bit of time it gets tastier and tastier, with a bit of a sweetness coming out. However, after a certain point of time quality drops quickly. At Fukucho, we bottle our sake at just the right time, which is something that varies from sake to sake, after allowing it to mature for the proper period, and without charcoal filtration. Charcoal filtration like that used in water filters is not necessarily a bad thing, but if sake is filtered in this way some of the original flavor and aromas will be stripped off. Unless sake conveys the strengths and weaknesses it has the moment it is pressed, it cannot really be called sake. Bottling sake without charcoal filtration allows us to express our pride in our brewing technology here at Fukucho. After sake is bottled, it is pasteurized using heat to kill bacteria. Usually, sake is heated on its way to the bottle during the bottling process. This is a very simple way to do it, but on the other hand the aromas and flavors are adversely affected when the sake is heated up like this. The other method is to place already-bottled sake into hot water. This allows the aromas to remain unaffected, and also after a specified period of time and temperature the bottles can be quickly chilled. Since this method is very labor intensive, it is usually a method used only for special sake like daiginjo, but here at Fukucho we use this method of heating already-bottled sake for all of our products, so as to maintain the original flavors and aromas. Also, originally most sake was pasteurized once on its way to the storage tank, and then again once more on its way to being bottled, so a total of two times. Regardless of how carefully this heat treatment is done, significant damage to the sake is unavoidable. At Fukucho, since we store our sake in bottles and not tanks and ship them the same way, we only need to apply heat one time. There are some instances when we need to pasteurize a second time if we rebottle from large bottles to smaller bottles, but of course even in these situations we protect the quality of the sake by pasteurizing in-bottle and quickly chilling the sake, in the same way. Sake must taste good when the customer drinks it. In order to both protect the fine flavors and aromas of sake, and also to bring them out even more, proper storage and maturation is of utmost importance. All Fukucho sake is stored in 1.8 liter bottles. Since it is possible to control storage conditions more minutely then when sake is in a large tank, it is therefore possible to exhibit fine changes in the sake. However, the cost for storing in bottles like this, both in terms of bottles themselves and space to store them, is quite high, so that few makers actually do it this way. Also, we have four different refrigerated storage facilities. Each one is maintained at a different temperature, and the lower the temperature the more slowly the sake will mature. Because the temperature variations are minimal, we can ship sake that is always feels young and with a well-rounded flavor. Since we are checking the condition of the sake constantly as we control the storage conditions, we sometimes pull sake out of the refrigerator if it is not maturing fast enough. Out intent is to keep the sake delicious until the time the customer enjoys it, and as such we carefully control storage conditions, so that the image of Fukucho as young, clean sake continues.